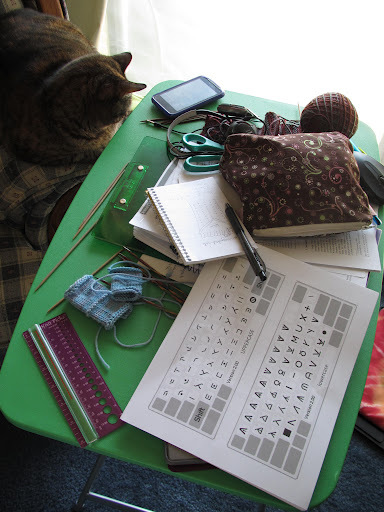 In the back are the socks I’m (supposed to be) knitting, in the middle is a book where I’m sketching out my next sock designs, in the front is a printout of a knitting font I downloaded, as well as a bunch of swatches for a dk-weight version of my first pattern, Beribboned Wrists. Underneath all of that are the papers I’m reading to incorporate into my horseshoe crab research publication. Sigh. So much on the brain! I’m knitting them in 100% merino Traveller yarn from The Sanguine Gryphon, that is now available from both Cephalopod Yarns and The Verdant Gryphon so yay for designing something in a yarn still available! Poor, sad, discontinued Zaftig. I love the first version of these wristwarmers I knit out of it, but I wanted to try them in something a little lighter weight that more people could still get their hands on. This is my first time actually making something from Traveller, and I really love how the colorway (Whispering City) is knitting up. SG and its descendents never cease to amaze me with their colors! What is your favorite dk-weight accessory pattern? This entry was posted in MyDesigns by shoelaceswitcher. Bookmark the permalink. 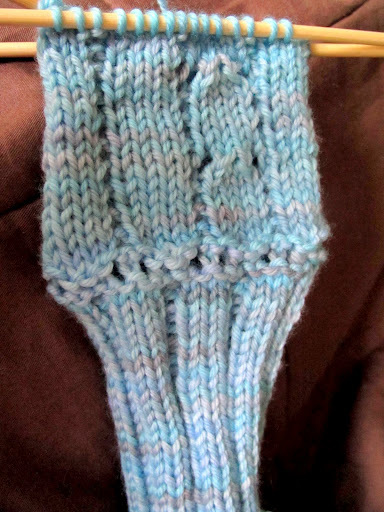 I love knitting wrist warmers. I also really like the ones you are working on, they intrigue me me a lot. I like your blog, and all the things you have going!